The shocking March 15th attack on two Mosques in Christchurch, New Zealand, has put the Islamic American community into a tailspin. The massacre took place on the other side of the planet, yet we Muslims here find ourselves struggling with grief, wrestling with fear, and praying for hope. After the killings, I heard the Friday Sermon, which focused on praying diligently, piety (Taqwa), connecting with God, the Greatness of the Prophets, Imams and companions, and the difference between the different denominators in Islam. On the following days, I listened to speeches at the Press Conference and Vigil and read numerous statements of sympathy and support. While I took great comfort in what many people said, it was clear to me there is a complete lack of understanding of our Imams and Muslim leadership. That shameful tragedy of 9/11 unleashed a torrent of anti-Muslim rage all around the world. Understandably so. But after the initial venting of pain, the backlash continued. Five Muslims countries have been destroyed because of the cycle of war on terror and Islamophobia, while simultaneously creating the largest number of refugees since WWII. In addition, Shia Mosques have been attacked all around the world, especially in the month of Muharram and at the time of the celebration of the Milad un Nabi (Birth anniversary of the Prophet). Where is that coming from and who all are responsible? On this issue, the majority of us Muslims have been either in denial or justifying of the atrocities committed on Shia Mosques and sure some have been an apologist and sympathetic to such attacks. Here in the U.S., in the name of national security and fear of terrorism/sharia law, Islam has been demonized, and Muslims stigmatized by flagrant violation of our civil rights. Islamophobic rhetoric has spread fear and inflamed political rallies. Anti-Muslim bigotry has become a multi-billion-dollar industry (Fox News/Rush Limbaugh). Publishers have been publishing anti-Islamic screeds at an unprecedented pace. Lest we justify all that rhetoric as simple First Amendment rights, thereby pretending that “sticks and stones won’t hurt my bones,” the flood of such hate speech has been accompanied by the promotion of violence. Hate crimes in the United States against Muslims surged 67% from 2015 to 2016, according to the Southern Poverty Law Center. In those two years, the number of anti-Muslim hate groups in the U.S. grew 197%. From January to July 2017, there were 63 attacks on mosques. Today disparaging Islam is socially acceptable behavior. It is promoted by well-funded billionaires with continuing support from their enablers in the Trump administration, starting with the president himself. Islamophobia has now become the institutional form of racism and fundamental violation of human right, equality and freedom. Hearing ourselves stereotyped as suicide bombers and terrorists, facing surveillance, and enduring detentions not only infringe upon Muslim-Americans’ constitutional right to freely practice our faith; it has marginalized us in the political process. In response, the Muslim voice has been silenced. What can Islamic-Americans do to reverse these trends? First, we need to galvanize to become more politically active and assertive. Not by being revolutionary and certainly not by using violent means. But we do need to exercise our own First Amendment rights to hold our politicians accountable for all the hate mongering they direct against Islam and Muslims. Second, having allowed ourselves to be passive consumers of media, we need to become active writers and producers of our own stories. 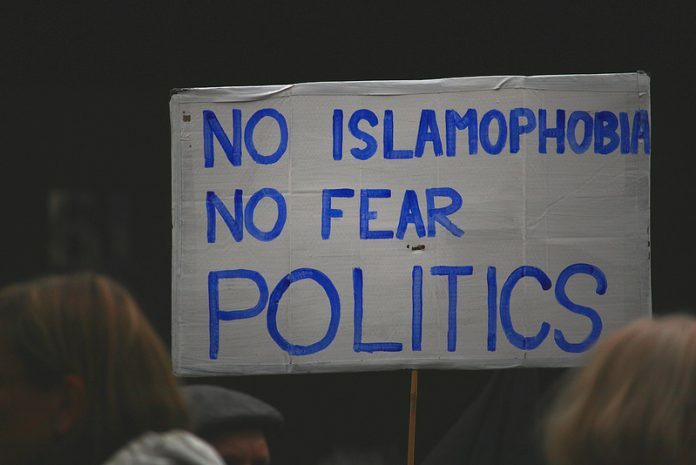 In order to fight against Islamophobia, our Muslim youths need to show a common interest in the whole culture by engaging in public campaigns, education initiatives, and shared advocacy for social justice against evils as mass incarceration and the opioid epidemic. Third, we need to promote widely a hospitable habit formed in recent years: inviting the whole community to open houses hosted at our Islamic Communities during the holy month of Ramadan. Such gatherings pose great possibilities of organizing interfaith dialogues and iftars, inviting politicians to our centers, leading discussions about the five pillars of Islam and about the peaceful nature of our religion. We hope to talk about the commonality of our faiths, our common interests, and share fellowship together. In sharp contrast, the horrific New Zealand mosque massacre in Christchurch proves that Christian White Nationalist and Wahhabi Salafi Deobandi (WSD) terrorists share a common ideology. Both strengthen the interventionist discourse of Neoconservatives and both are a by-product of “Enlightened” European Colonialism. Both ideologies also stand behind the mass shootings against other communities of color in their houses of worship — Sikhs in the gurdwara of Oak Creek, Wisconsin, Black Americans in Mother Emanuel AME Church in South Carolina, and Jews at the Tree of Life Synagogue in Pittsburgh. This deadly violence is the inevitable conclusion of unchecked white supremacy and Islamophobia. Muslims need to become politically active, register to vote, run for political office and fight at the ballot box to remove the elected officials who are racist. To the elected officials who actively promote bigotry or stay silent as our communities are attacked, we are watching! Previous articleWill Christchurch be our wake-up call?